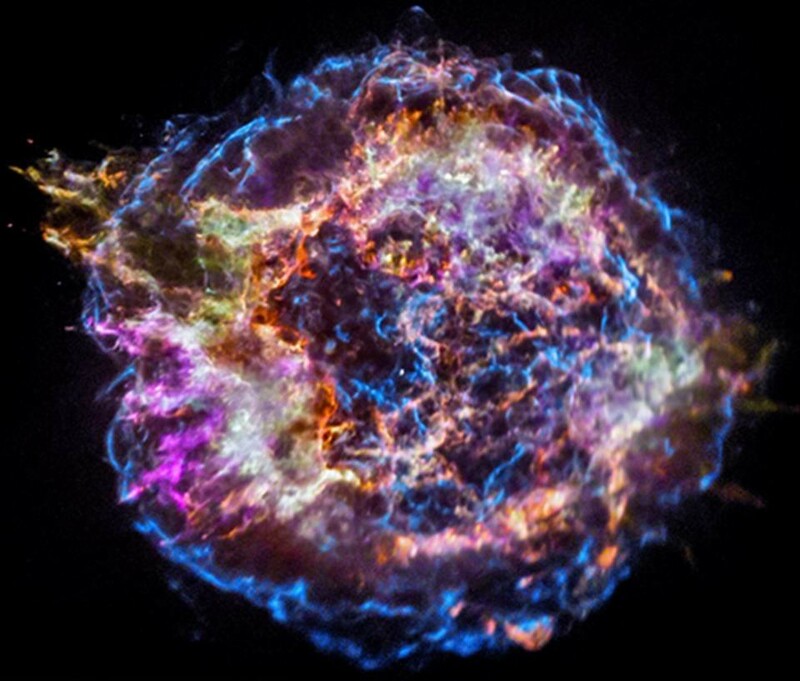 The supernova remnant Cassiopeia A contains signatures of a wide variety of elements of the periodic table, including everything necessary to create DNA. Image credit: NASA/CXC/SAO. It isn’t the Big Bang or stars like the Sun that gave rise to us. The story is far more… explosive. At the smallest level, the human body is made up of particles: mostly atomic nuclei and electrons. The elements in the human body. While, by mass, we are mostly Oxygen, Carbon, Hydrogen, and Nitrogen, there are dozens of elements essential to life processes in the human body. Image credit: Openstax college, Anatomy & Physiology, Connexions Web site. Although there are some 90 naturally occurring elements, they originate from a huge variety of places prior to ever arriving on Earth. The Big Bang produces matter and antimatter, with slightly more matter being created at some point, leading to our Universe today. In the earliest stages, before any stars form, only hydrogen, helium, and trace amounts of lithium are produced. Image credit: E. Siegel / Beyond The Galaxy. The hot Big Bang provides the origin of the lightest elements: hydrogen and helium, which still make up 98% of today’s Universe. An artist’s impression of the environment in the early Universe after the first few trillion stars have formed, lived and died. The existence and life cycle of stars is the primary process that enriches the Universe beyond merely hydrogen and helium. Image credit: NASA/ESA/ESO/Wolfram Freudling et al. (STECF). Stars that live, burn, and die provide that other 2%, claiming responsibility for the complex molecules contained in our Universe. The creation of free neutrons during high-energy phases in the core of a star’s life allow elements to be built up the periodic table, one at a time, by neutron absorption and radioactive decay. Supergiant stars and giant stars entering the planetary nebula phase are both shown to do this via the s-process. Image credit: NASA, ESA, and The Hubble Heritage Team (STScI/AURA). Small stars, like the Sun, fuse light elements into heavier ones, slowly building the high-end of the periodic table by adding neutrons one-at-a-time. Supernova remnant G1.9+0.3, perhaps the galaxy’s most recent supernova, as imaged by Chandra in 2013. The signatures of supernova remnants and ejecta lead us to conclude exactly how much of each heavy element originates from this source. Image credit: NASA/CXC/NCSU/K.Borkowski et al. Larger stars end their lives in supernovae, with their cores collapsing and imploding, expelling huge amounts of burned fuel back into the Universe. In the final moments of merging, two neutron stars don’t merely emit gravitational waves, but a catastrophic explosion that echoes across the electromagnetic spectrum and a slew of heavy elements towards the very high end of the periodic table. Image credit: University of Warwick / Mark Garlick. Meanwhile, white dwarfs and neutron stars merge and explode, enriching the Universe even further. This image from NASA’s Chandra X-ray Observatory shows the location of different elements in the Cassiopeia A supernova remnant including silicon (red), sulfur (yellow), calcium (green) and iron (purple). Each of these elements produces X-rays within narrow energy ranges, allowing maps of their location to be created. Image credit: NASA/CXC/SAO. Owing to NASA’s Chandra X-ray telescope, we can observe how much of each heavy element comes from recent supernova explosions. The elements of the periodic table, and where they originate, are detailed in this image above. The vast majority of the human body, including the majority of our oxygen, carbon, nitrogen, phosphorous, calcium, and iron, all owe their primary origin to massive stars that have gone supernova. Image credit: NASA/CXC/SAO/K. Divona. As it nears the end of its evolution, heavy elements produced by nuclear fusion inside the star are concentrated toward the center of the star. When the star explodes, the vast majority of the outer layers absorb neutrons rapidly, climbing the periodic table, and also get expelled back into the Universe where they participate in the next generation of star and planet formation. Image credit: NASA / CXC / S. Lee. The biggest find? Every element required to make DNA is found in the aftermath of exploding stars. Scanning electron microscope image at the sub-cellular level. While DNA is an incredibly complex, long molecule, it is made of the same building blocks (atoms) as everything else. Image credit: Public domain image by Dr. Erskine Palmer, USCDCP. Mostly Mute Monday tells the cosmic story of an astronomical object, image, or phenomenon in pictures, visuals, and no more than 200 words.